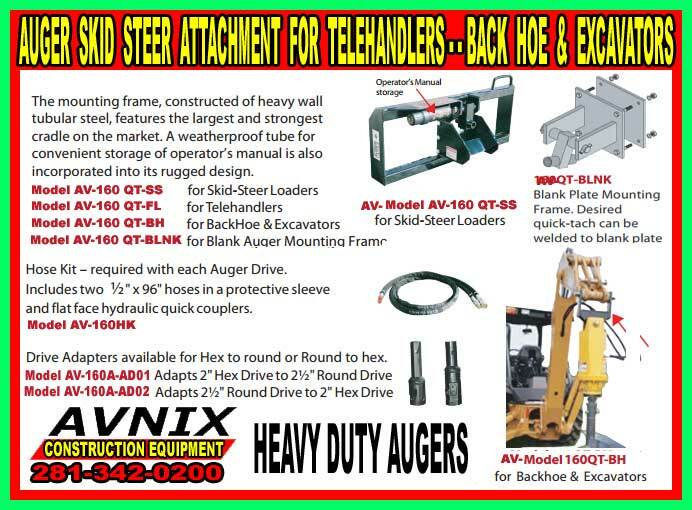 Avnix Auger Skid-Steer Attachment is perfect for all drilling applications. Our hydraulic auger drives are for systems operating between 10 and 35 GPM and 2000 to 3000 PSI. Our heavy duty planetary auger drive attachments feature heavier mechanisms than all competitors and perform better than all other auger drives in their class. 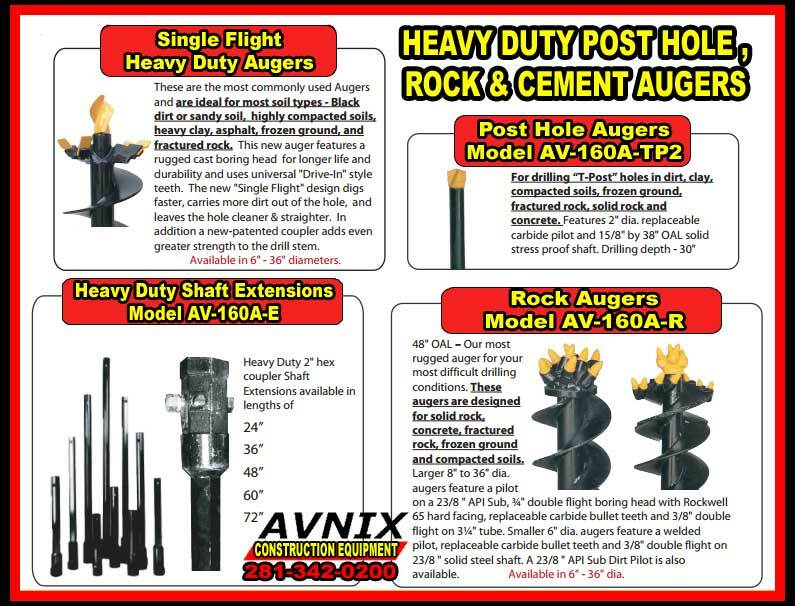 Coupled with the correct auger, they can handle any dirt, rock, cement or post hole auger drilling need. The auger mounting frame, constructed of heavy wall tubular steel, offers the largest and strongest cradle on the market. A long-lasting tube for suitable storage of operator’s manual is also integrated into its durable design. 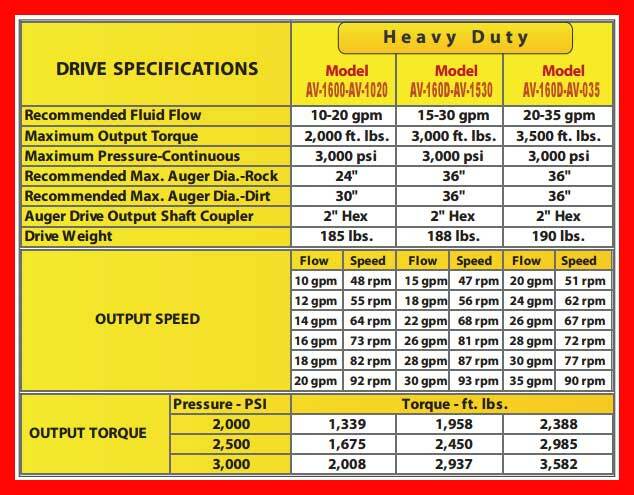 Auger Hose Kit – mandatory with each Auger Drive. Includes two ½” x 96″ hoses in a protective sleeve and flat-face hydraulic quick couplers. Model160HK Drive Adapters available for Hex to round or Round to hex. 48″ OAL – These are the most common used augers and are specified for moderate soil conditions such as dirt, clay and small fractured rock. These durable augers feature a fabricated boring head, hardened bolt-on teeth, hardened bolt-on fishtail pilot, ⅜” thick double flight and a 3 1/4″ tubular shaft. Available in 6″ – 36″ diameters. 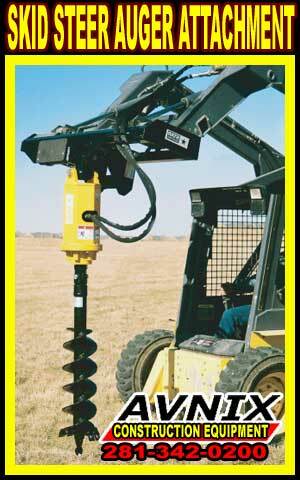 48″ OAL – A very rugged auger for tough ground conditions. Recommended for compacted soils, heavy clay, asphalt, frozen ground, and fractured rock. HD Augers feature a cast boring head with replaceable Pengo style drive-in teeth, hardened bolt-on fishtail pilot, ⅜” thick double flight and a 3¼” tubular shaft. Available in 6″ – 36″ diameters. These are the most commonly used Augers and are ideal for most soil types – Black dirt or sandy soil, highly compacted soils, heavy clay, asphalt, frozen ground, and fractured rock. This new auger features a rugged cast boring head for longer life and durability and uses universal “Drive-In” style teeth. The new “Single Flight” design digs faster, carries more dirt out of the hole, and leaves the hole cleaner & straighter. In addition a new-patented coupler adds even greater strength to the drill stem. Available in 6″ – 36″ diameters.